Alan Butkovitz lost the Democratic nomination for City Controller to Rebecca Rhynhart. Rebecca Rhynhart won the Democrat nomination for City Controller. Unlike the district attorney race, the May primary race for city controller wasn’t crowded or unexpected. But when Rebecca Rhynhart unseated three-term City Controller Alan Butkovitz on Tuesday, some eyebrows raised. After all, Butkovitz held his position for 12 years with a proven record. After spending 14 years representing the Northeast, Butkovitz 2005 victory was filed with wins including his 2011 review of the Sheriff’s Office followed by his whistle blowing on the Mayor’s Fund. With his bold statements and serious investigations, the Butkovitz was a name many had come to know. A former ward leader and state representative, Butkovitz had served the city in many ways and in different capacities. But Rhynhart insisted the city was looking for someone new. And apparently, she was right. According to the Philadelphia Inquirer, 94 percent of precincts reported that Rhynhart outpaced Butkovitz at a 3-2 ratio, making her the city democrat’s choice to run against Mike Tomlinson in the general election in November. Rhynhart, former chief administrative officer for Mayor Jim Kenney’s and former budget director for Mayor Michael Nutter, had marketed herself as a newcomer in the city and many are even stating her win was a sign that the city’s democratic machine was failing. Rhynhart’s campaign relied on the idea that Butkovitz as a career politician despite having worked for politicians in much of her career. 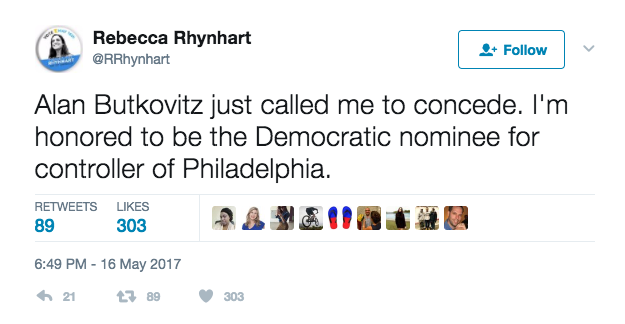 To counter Rhynhart’s claims, Butkovitz played a similar game calling Rhynhart a political insider who didn’t have the experience to get the job done. But on Tuesday night, Butkovitz conceded. Rhynhart’s win leads her into a head-to-head race against Republican Mike Tomilson, a certified public accountant for insurance companies who ran unopposed.